The news comes like a sledgehammer into the stomach: "I'm sorry to tell you, but you have cancer." Every year, millions of Americans are devastated by news of cancer or another dreaded disease. What soon follows is an avalanche, a tidal wave of emotions: fear, anger, bewilderment, indecision, and the need to reach out to a family member or a loved one for support and encouragement. In their lifetimes, 38% of all people will develop a form of cancer. Quite often, a person's first reaction is to think, "No way, not me. I'm a good person," as if the cancer resulted as a punishment for unresolved issues. This is not true. Then comes an overwhelming need to get information. And that is probably why you are reading this. You need to become the best and smartest patient your doctor ever had, simply because you need to be. For most people, the cancer can be cured or controlled by surgery and, in some cases, by combinations of radiation therapy and chemotherapy. Never before has the outlook for cancer treatment and cure been so hopeful. For a proportion of people, however, the cancer continues to spread. This can be a devastating development. Those coping with cancer can become distracted by feelings of anger and hostility, not only toward the cancer but also toward the doctors and nurses trying to help. This is a normal reaction. There are those who say: "If the cancer progresses, it must mean that I did not try hard enough." That is never the case. Attitude does matter, but not in the way we often think it does. We have learned from the long-term cancer survivors that it takes social support and connectedness on this journey. MYTH: Progress for people with advanced cancer has been so slow because there is a conspiracy between the American Medical Association and drug companies. Some people with cancer and their families think doctors are keeping the cure for cancer under wraps so that money can be made from cancer treatments. REALITY: Does any reasonable person think that a cure for cancer would remain secret for long? Obviously not. Now, let's think about this for a moment. Nurses get cancer. Pharmacists get cancer. Physicians get cancer, as do family members of these professionals. With the Internet and high-speed modems, it is inconceivable that some scientist laboring in isolation in a bunker someplace will have a cure for this problem. The World Wide Web can be your best source for sound information (but also at times a repository for some of the worst). A cure for cancer does not exist in cyberspace, or in a clinic in Mexico, or with a healer in the Philippines. MYTH: We can put a man on the moon. We can send a rocket around Jupiter. Why can't we cure cancer? REALITY: This question underscores a common misunderstanding that cancer is one disease. In fact, cancer is a group of hundreds of diseases. Each disease has a unique biological record, and each of which may be caused by very different circumstances. Cancer which starts in the breast is different disease than cancer which starts in the lung, for example. One "magic bullet" will not eradicate all types of cancers. A major study from the University of Chicago stated that the survival from cancer is no different now compared with 30 years ago. This is an extreme view because, in fact, people with cancer are living longer and clearly have a better quality of life than they did a generation ago. Today, 2 of every 3 of those diagnosed with cancer are alive more than 5 years following their diagnosis. In 1970, this was only true for about 1 in 3. We know this because some cancers are indeed curable, even in the far advanced stages as with testicular cancer, Hodgkin's and non-Hodgkin's lymphomas, acute leukemia in both children and adults, and in a few other types of cancer. MYTH: If we can only hold on for a few more months, a cure will be on the horizon and all will be well. 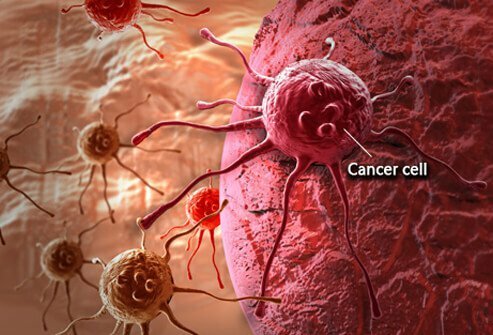 REALITY: Although there have been spectacular advances in the treatment of cancer and although people are living far longer today than in any time in history, it is not reasonable to expect that, within the next years, there will be a "heat-seeking missile" or some magical vaccine to annihilate cancer. Progress against this dreaded group of diseases has been agonizingly slow, but it is moving forward in the right direction. Clinical trials and conventional therapies hold promise, but cure is not possible for most people with advanced cancer, which is already spread to other parts of the body when it is first found. But what is possible is an often longer-lasting as well as a better quality of life because we now have far better treatments for the types of cancer and pain, nausea, and vomiting than we did just a few years ago. Acknowledge the seriousness of your diagnosis. You need to know your diagnosis. Because if you can see the enemy, and name the enemy, you can often better fight it. So if you are comfortable doing so, ask to see your X-rays, CT scans, mammograms, bone scans, and MRIs. Find out precisely what type of cancer you have, the stage of your cancer, and whether it has spread. Take time to take your best shot. The diagnosis of cancer is devastating and can seem paralyzing. The very words "You have cancer" overwhelm our senses of judgment and reasoning. So take time to think about your course of action before you rush to treatment. By the time a cancer has been detected on a chest X-ray, it has been present for about 5 years. It has simply been too small to detect. By the time a mammogram shows a breast cancer, it also has been present for about 5 years. Therefore, there is no urgency to rush into treatment within a day or two of diagnosis. We need to keep in mind that many treatment options cannot be reversed. For example, surgery for removal of the breast can be a major procedure with an impact upon your sense of your body image. Take your time to ask about and understand your options. As with most situations in life, the first shot is the best. If the first-string team is not winning, what chance does the second string have? The same holds true with cancer. If the first kind of treatment does not work, the person is usually weaker and sicker, making the success of the second treatment low. Not zero. But low. In general, you may be offered 1 of 4 strategies or combinations: surgery, radiation therapy, biologic therapy, or chemotherapy. Be sure you understand whether or not the cancer is potentially curable. Understand the difference between being well enough for surgery versus whether or not the cancer appears to be resectable. The former means that you are capable of tolerating the rigors of surgery. Resectable means that the surgeon believes he or she can remove the tumor. If the tumor cannot be fully removed, if disease is left behind, the outlook may be very serious. In a sense, all patients can have an operation, but if the cancer either does not appear to be resectable before surgery, or at surgery cannot be removed in its entirety, the surgery may not ultimately provide much benefit. Ask the doctor about the pros and cons of less invasive techniques. For example, a generation ago, women with breast cancer were treated with a radical mastectomy and the entire breast and chest wall muscles were removed. Today, the removal of a small amount of breast tissue roughly the size of several sugar cubes followed by radiation and chemotherapy provides results equal to or better than more aggressive treatments. Know all about types of chemotherapy if they are recommended and you choose to take it. Find out the names of the drugs, their side effects, and how they will be administered, such as orally through pills, by IV, or as pills under the tongue. In general, these can be somewhat toxic drugs with significant side effects. You want to know up front: What benefit am I being offered by chemotherapy? What does this mean? What will it cost me both in terms of side effects and dollars? Doctors may state that survival is increased by 50% by the use of chemotherapy. Now, for the bad news: If survival is increased from 2 months to 4 months and if those remaining 8 weeks are associated with nausea, vomiting, weakness, and fatigue, that may not be a good bargain. Find out exactly what you are possibly "buying" from chemotherapy. Not every patient gets the benefit from chemotherapy, but all may get side effects. The offer of a doubling of your expected survival may only occur if you get benefit from the treatment. Ask what the likelihood is of benefit and what that benefit may include. Will your pain get better, or will it just be that a lump of cancer will shrink for a while? There is yet another strategy, and that is to do nothing. For some people, this may be the best choice. Sometimes, we can actively and aggressively watch the patient to detect subtle indications that the cancer is worsening. Cancer of the prostate is an example. Some cells may be dormant for many years, and the treatment may be worse than the disease. In some cases, watchful waiting is a sensible option to consider. Learn the language of cancer. Understand your disease, and you'll be a true partner in your treatment. The Internet has provided people access to tens of thousands of Web sites specifically focusing on health issues. The information on the Internet can be your best ally or your worst enemy. As an ally, use the information from trusted medical sources to make yourself the smartest person your doctor has ever treated. Be wary of sites sponsored by companies hoping to sell you a product or medicine. Access Web sites listed in the next section for more information. If you do not know how to use this tool, friends and family can surely help. Be careful with message boards. People with the same type of cancer that you have, at the same stage, and at your same age may still have very different responses to treatment. Trust your doctors, and remember each person is different. Create an equal partnership between you and your oncologist (your cancer specialist). Don't give up or just go along with medical decisions made by someone else. You are allied against a common foe (your disease) with hopes of achieving 1 of 3 goals: a cure, quality time, or decreased symptoms. Ask your family and friends for support but do not proceed with treatment just because they think it is the "right" thing to do. Keep in mind that you (or your advocate) need to be appropriately assertive in treatment decisions. Speak up. Be involved. It's your life. Don't put too much weight on asking the doctor what he or she would do in similar circumstances. It's tempting to go along with the doctor who says, "Well, if you were my mother . . ." or "I'd advise my golfing buddy . . ." They are not you. Don't be shy. Recognize the importance of a second opinion. No single institution and no one doctor can have complete information about all types of cancers. As professionals, they should not be offended if you want to seek a second opinion. This is a common practice in medicine today. If a major cancer center or university has a particular expertise in your cancer, it certainly makes good sense to seek out a second opinion there. Almost never will the local physician be offended, and if he or she is, that is even more reason to seek another opinion. Support groups in the city where the medical center is located or bona fide groups on the Internet can provide names of local experts. Call on one with your doctor's support. Don't let the rest of your life unravel while you deal with cancer. Understand that you have only so much energy, and this energy needs to be divided into dealing with the cancer but also paying the bills and being attentive to the normal mundane chores of daily living. Life when you are healthy is a full-time job. Be realistic. Cut back. Slow down and smell the roses. Nobody can go it alone, and now is the time to reach out and seek help from friends and neighbors. Acknowledge the importance of a support system. Lots of studies show that friends, families, colleagues, and even pets can enhance the well-being of anyone who is ill—and perhaps increase survival, although the latter point is somewhat controversial. A friend can be an anchor during some stormy times. Don't ignore the resources of your religious group, if you have one. Do not look back with anger or regret. On Monday morning, everyone is an expert quarterback. This also applies to picking winning stocks. Energies need to be focused on today and not on past events. To sadly or angily rehash diagnostic tests or treatments that were not effective simply takes energy away from the task at hand. We cannot change the past, only the future. One person told me that after the diagnosis of cancer, everything, yes everything, became crystal clear. Relationships, priorities, the to-do list. What was important became obvious: family and friends, but not all the other "stuff" that distracts us. Seize the day. Savor each opportunity. After all, today is really all that any of us has. The American Cancer Society is a nonprofit organization with local chapters in many communities. You'll find answers to questions about the nature of cancer, its causes, and risk factors. The online Cancer Resource Center discusses the latest strategies for prevention and early detection, new diagnostic techniques, and the latest treatment options. You can also find information about alternative and complementary methods. National Cancer Institute is the nation's primary agency for cancer research. The NCI supersite links to various other cancer sites including CancerTrials where you can find out about clinical trials in cancer research. Different kinds of cancer have different, unique symptoms. Some of the following symptoms definitely require medical attention and may indicate cancer. These symptoms usually represent simple infections such as bronchitis or sinusitis. They could be symptoms of cancer of the lung, head, and neck. Anyone with a cough that lasts more than a month or with blood in the mucus that is coughed up should see a doctor. 1. Becker M, Morton D. The Healing Power of Pets: Harnessing the Amazing Ability of Pets to Make and Keep People Healthy. Hyperion Press; 2002. 2. Creagan ET. Attitude and disposition: do they make a difference in cancer survival?. Mayo Clin Proc. Feb 1997;72(2):160-4. [Medline]. 3. Creagan ET. How to break bad news without devastating the patient. Prime Practice [serial on CD-ROM]. 1996;Vol 2. 4. Creagan ET, Wendel SJ. How Not to Be My Patient: A Physician's Secrets for Staying Healthy and Surviving Any Diagnosis. Health Communications, Inc; 2003:[Full Text]. 5. Mayo Foundation for Medical Education and Research. Diagnosing cancer: What to expect. MayoClinic.com. Diagnosing cancer: What to expect. 6. Murphy GP, Morris LB, Lange D. Informed Decisions: The Complete Book of Cancer Diagnosis, Treatment, and Recovery. American Cancer Society; 1997.